An aspiring songwriter joins a band made up of a group of eccentric players fronted by a guy named Frank, who wears a giant artificial head that he never takes off. 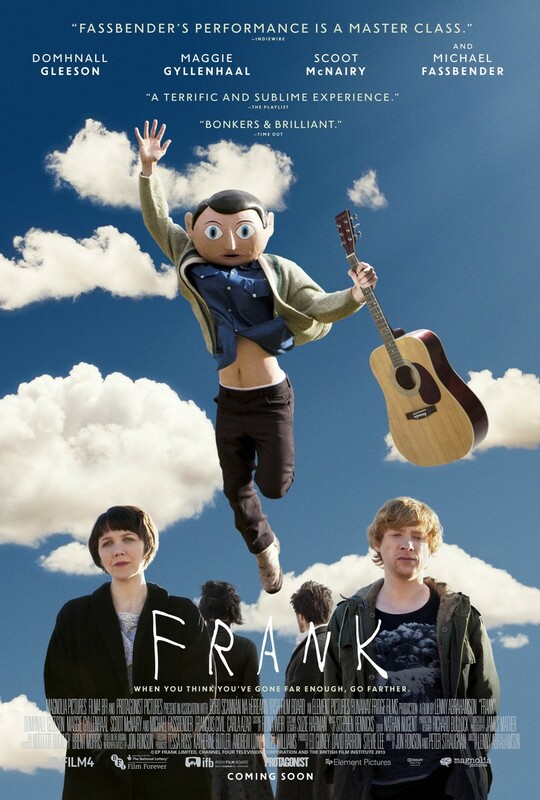 "Frank" is a wonderfully weird movie directed by Lenny Abrahamson, who is best known as the director of the best picture-nominated film "Room." It is written by Jon Ronson and Peter Straughan and is based on a newspaper article written by Ronson. The film centers on an aspiring songwriter and keyboard player named Jon Burroughs (Domhnall Gleeson). Jon is struggling to write his music, but one day by chance, he happens upon a man having a mental breakdown at the beach. This man happens to be a keyboardist in the band The Soronprfbs. While gawking at the whole scene, Jon mentions to another bystander that he is a keyboard player. It turns out, this bystander is another member of The Soronprfbs, who asks Jon to join the band for a gig. 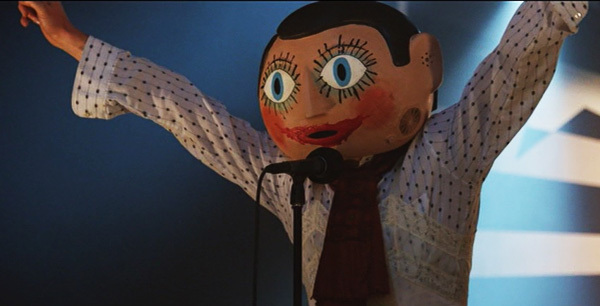 Their gig doesn't go well at all, but the band's leader Frank (Michael Fassbender), who wears a giant fake head that he never takes off, asks Jon to join the group anyway. Jon joins the group for what he believes is a weekend gig, but he is actually wanted for a months-long recording session where he will be trapped in a relatively isolated cabin with a moderately unstable group of people. Jon decides to document the entire ordeal on social media, which gains the group a new fanbase and may lead to bigger things if they can mentally hold it together. What if you really wanted to be a songwriter but didn't have the talent to achieve your goal? That's the situation for the film's protagonist Jon. His desire to make it in the world of music leads him to shack up with an eccentric group of people that he doesn't exactly mesh well with despite a mutual love of all things rhythm and melody. The situations that occur at their remote cabin in the woods create a lot of funny, sometimes tension-filled moments. The type of humor in this movie is very offbeat and can be quite dark. It won't be for everyone, but since we are a little twisted, it worked really well for us. 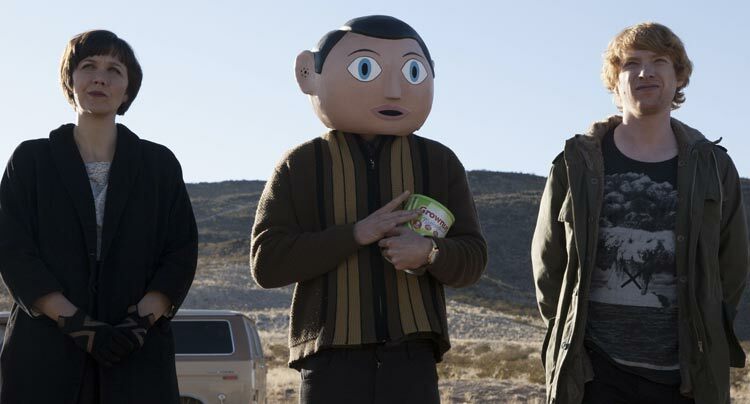 We love Michael Fassbender's portrayal of the mysterious titular Frank. 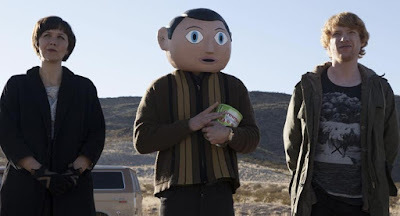 Since Frank wears a giant fake head, we can't see his face. To make Jon more comfortable, Frank begins to describe his facial expressions out loud. It is a simple thing, but it made us roar with laughter each time he casually dropped a phrase like "welcoming smile" or "big, non-threatening grin" in the middle of a sentence. At its core, "Frank" is a slice-of-life film about Jon's strange journey with The Soronprfbs. There's a lot of conflict that stems from the direction the band is going to take. Jon's overwhelming desire to become a rockstar consumes his every thought as he thinks Frank is his ticket to stardom. On the other hand, Maggie Gyllenhaal's Clara believes Frank and the band are pure, authentic artists who just need to express themselves regardless of whether or not they have an audience. This struggle is an intense, interesting one that kept us engaged and always guessing what would happen next, especially considering the fact that Jon is secretly documenting his experiences with the band online. "Frank" is a film that is completely unique is so many ways. Watching it made for an entertaining experience, and we relished in every damn minute of this quirky music dramedy. It is not an experience everyone will enjoy, but if you are predisposed to appreciate slightly off-kilter dark comedies with catchy tunes and bigger themes at play, you'll probably get a lot out of watching "Frank." The un-curious need not apply. Really enjoyed this movie. Especially the music. We did as well! Thanks for commenting, Manny! So glad you enjoyed this one.